New York: The Derrydale Press, 1939. 1/2 leather. Very Good +. Philip Rickman. #116 of only "125 numbered copies of this book, specially printed on hand-made paper, signed with a pencil remarque by the artist", Philip Rickman. Bound in 1/2 tan pigskin, with 5 raised bands and morocco spine label. Brown cloth panels, bright gilt-titling to the front panel. 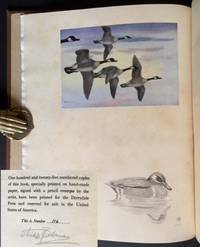 Printed on hand-made rag paper, 48 pgs., 20 color plates and an original remarque of a duck, initialed by Rickman on the lower part of the frontis page. The original prospectus and order blank laid-in as well. Frazier P-11a: "A rare, lovely and valuable work." A solid, well-preserved, VG copy, with a slight "freckling" to the top and bottom-edges of the front panel and a faint, half-circle darkening mark at the edge of the leather spine. Tall quarto, top-edge gilt, deckled fore and bottom-edges. Also includes a sturdy, very respectable example of the original card slipcase, numbered #116 at the foot of the spine to correspond with this specific copy. Boston: Houghton Mifflin Co, 1895. Cloth. Very Good +. Collected by C.F. Orvis. 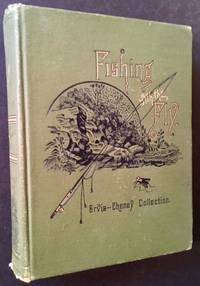 A clean, well-preserved copy of the 1895 printing (the original printing was 1883) of this classic in late 19th century angling literature. Solid and VG+ in its olive-green cloth, with bright gilt-titling and design along the front panel and spine. Very light creasing to the preliminaries and along several page edges. 12mo, (15) color plates thruout showcasing samples of the hand-made flies from the Orvis-Cheney collection, which was housed in Manchester, Vermont. London: The Proprietors, Walter Goldsmith & Co. Ltd, 1938. Cloth. Very Good +. 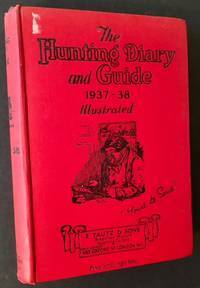 A solid, crisp copy of this 1937-38 edition of The Hunting Diary, issued out of London by Walter Goldsmith & Co. Ltd. Filled with wonderful local, period ads in addition to high-quality black-and-white photos thruout of the foxhunting scene. The diary itself --the second half of the text-- consists of both pink and off-white paper and is completely clean and unmarked. One tiny piece of paper residue at the upper front panel, otherwise clean as could be. 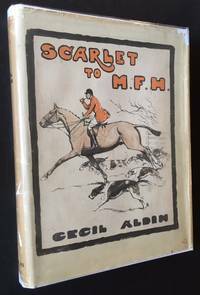 Octavo, a wonderful glimpse into the rarefield world of British fox-hunting. New York: Charles Scribner's Sons, 1933. Cloth. Near Fine/Very Good. Cecil Aldin. A solid copy of the 1933 1st American edition. Tight and VG+ to Near Fine (with very light foxing at the pastedowns) in a crisp, price-intact, VG dustjacket, with light chipping along the spine ends, the front panel's upper tip and the rear panel's top-edge. Still though, very presentable. Quarto, very nicely illustrated thruout --fully capturing the spirit of the fox-hunt-- by the great Cecil Aldin. Boston: Ticknor and Fields, 1854. Decorative Cloth. Very Good +. William Harvey. The 1854 2nd edition (?) of this uncommon juvenile tale of hunting and exploration. 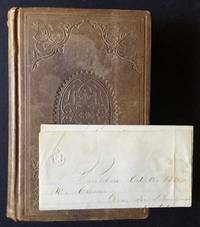 Written by the trapper and hunter Mayne Reid, who was elevated to Captain in 1845 during The Mexican War. A very well-preserved copy to boot: Tight and VG+ in its light-brown boards, with decoartive blindstamping and bordering to the panels, and elaborate gilt-design and titling along the spine. Internally, very clean as well, with light foxing to the pastedowns and endsheets but very little throut the text. Thick 16mo, 364 pgs., a number of engraved illustrations thruout by William Harvey. THIS COPY ALSO INCLUDES A WONDERFUL LAID-IN LETTER (UNRELATED) FROM A WILLIAM C. LODER TO A MR. CRESSEN OVER THE DELIVERY OF 2 BARRELS (COSTING 45 CENTS EACH) OF SWEET POTATOES TO BE TRANSPORTED ON THE SLOOP HENRI GULLIE TO PHILADELPHIA FROM BALTIMORE. The letter is clean and well-preserved and very legible, having been folded into thirds and carefully maintained. A nice piece of 18th century Americana to add to this mid 19th century tale of adventure for boys. Paris: Librairie Cynegetique, 1931. Original wraps. Very Good +/Very Good -. 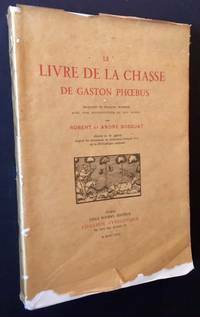 Elegant 1931 Paris re-issue of this Medieval book on hunting, written between 1387 and 1389 by Gaston III, Count of Foix (also known as Febus or Phoebus) and originally published in 1507. This re-issue is tight and VG+ in its off-white wrappers, with light creasing at the front panel's lower-tip and just a touch of soiling along the rear panel. Also includes the original glassine dustjacket, which shows a degree of light chipping but has protected the wrappers well. Quarto, uncut signatures, illustrated with 87 figures --including woodcuts-- based on the miniatures in the original manuscript. New York: Grosset & Dunlap, 1928. Cloth. Very Good +/Very Good -. A perfectly serviceable copy of the 1928 Grosset & Dunlap re-issue, in its pictorial dustjacket. Solid and VG+ (light sunning to the spine crown) in a crisp, VG- dustjacket, with substantial chipping along the spine (with roughly 25% loss) and one 2" x 2" chip at the front panel's lower-edge. Still though, attractive and presentable. 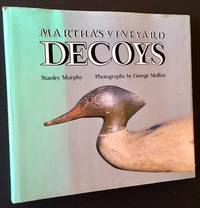 Quarto, wonderful sepia-toned photographs thruout by Zane Grey himself. New York: Timken Editions, 2000. 1/4 cloth. Fine. Jane Timken. 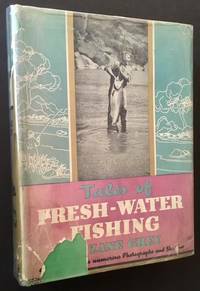 A pristine copy of this utterly charming ABC angling book. Letter "C" of only 26 copies issued, signed by the author and illustrator Jane Timken (at the limitation) and including the lovely pochoir stencils thruout. Handsomely bound as well in its 1/4 dark cloth over yellow boards by Carloyn Chadwick. Square octavo, also includes an immaculate example of the salmon stiff-card slipcase. 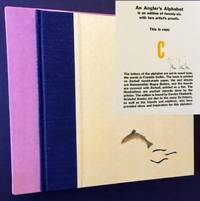 Beautiful fishing-themed plates at each recto, a first-rate alphabet book --and artist's book. Boston: David R. Godine, Publisher, 1978. Hardcover. Near Fine/Very Good +. A very solid copy of the 1978 1st edition. Tight and Near Fine in a bright, price-intact, VG+ dustjacket, with light, even offsetting --and just a bit of foxing and creasing-- along the panels. Oblong quarto, hundreds of crisp black-and-white (and a small number of color) plates thruout. By Henry A. Fleckenstein, Jr.
Exton, PA: Schiffer Publishing Ltd, 1983. Cloth. Fine/Fine. 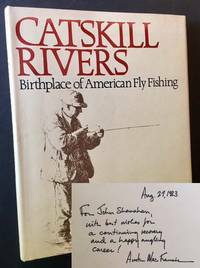 INSCRIBED BY THE AUTHOR HENRY FLECKENSTEIN IN YEAR-OF-PUBLICATION on the half-title. A pristine copy to boot of the 1983 1st edition. Tight and Fine in a bright, Fine dustjacket. Quarto, hundreds of crisp black-and-white plates thruout. Exton, PA: Schiffer Publishing Ltd, 1979. Hardcover. Near Fine/Very Good +. INSCRIBED BY THE AUTHOR HENRY FLECKENSTEIN IN YEAR-OF-PUBLICATION on the title page. A very solid copy to boot of the 1979 1st edition. Tight and Near Fine in a bright, VG+ dustjacket, with just a touch of light foxing along the top-edges. Tall quarto, hundreds of crisp black-and-white and color plates thruout. Exton, PA: chiffer Publishing Ltd, 1981. Hardcover. Fine/Near Fine. 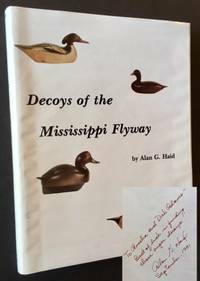 WARMLY INSCRIBED BY THE AUTHOR ALAN G. HAID on the half-title. A tight, very nice copy to boot of the 1981 1st edition. Clean and Fine in a bright, Near Fine dustjacket. Quarto, hundreds of crisp black-and-whte and color photos thruout. Fayetteville, NY: Tenant House Press, 1978. Original wraps. Very Good +. Louis W. Schifferl. 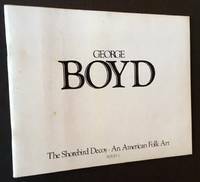 A handsome copy of the 1978 1st edition of this monograph on shorebird decoy artist George Boyd. Tight and VG+ in its printed, stapled wrappers, with very light foxing along the front panel. Oblong octavo, crisp black-and-white and color photographs thruout. London: Bickers & Son, 1904. Cloth. Very Good. The uncommon 1904 1st UK edition. Solid and VG in its light-green cloth, with bright gilt-titling along the front panel and spine. Very light wear to the panel edges, tender --but still perfectly sturdy-- hinges. 12mo, "sixteen illustrations from photographs of wild animals"
Boulder, CO: Johnson Books, 1988. Cloth. Fine/Near Fine. 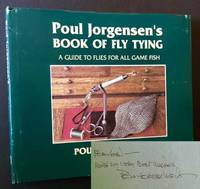 INSCRIBED BY POUL JORGENSEN on the front free endpaper. A crisp, very sharp copy to boot of the 1988 1st edition. Tight and Fine in a bright, price-intact, Near Fine dustjacket, with just a touch of rubbing to the front panel. Oblong quarto, dozens and dozens of high-quality black-and-white (and a number of color) photographs thruout. 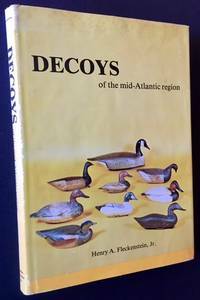 New York and Piscataway, NJ: Nick Lyons Books/Winchester Press, 1983. Cloth. Near Fine/Near Fine. John Manikowski. WARMLY INSCRIBED IN YEAR-OF-PUBLICATION BY THE AUTHOR AUSTIN FRANCIS on the half-title. A very sharp copy to boot of the 1983 1st edition. Tight and Near Fine in a crisp, price-intact, Near Fine dustjacket, with the faintest amount of light chipping at the front panel's bottom-edge. Quarto, maps by John Manikowski. 1913. Original wraps. Very Good +. Wonderful album documenting a month-long camping, hunting and fishing trip (started on June 12th, 1913) among several dozen American friends (mostly couples) at "Camp Welcome" in Saw Mill Bay, Prince William Sound, Alaska. Now a popular tourist destination, Saw Mill Bay was clearly very remote at the time (this trip having taken place almost 50 years before Alaska gained statehood) and was chosen by this group for its scenic beauty and seclusion. Dozens of crisp, pasted-in black-and-white photos (most with running captions) capture the group in its various stages of engagement (or non). 2 separate ships ("S.S. Restless" and "Visators Day"), which between them stopped at Los Angeles, San Francisco, Portland, Cordova, Alaska and Valdez, Alaska, delivered the entire group to Camp Welcome by June 12th. We know this because of the "Camp Welcome Visators (sic) Register", a full page listing all of the campers. Preceding this is a full-page menu for June 5th 1913 ("Camp Welcome Grill") and following it is 2 dense, typed pages of fun running commentary by Mr. G. Fawcett and E.W. Hunt. The album is bound in its ribbon-tied, stiff black wrappers and consists of 14 separate pages (all packed with photos and commentary) and a stiff beige re-inforcement at the rear panel. The oblong album (which measures 10 1/4"x7") is clean and crisp and has held up very nicely. This is largely because of the handsome custom-made, oatmeal-cloth box which was designed to house it. The box is tight and Near Fine and even boasts a red-leather title label (with gilt-tooling and lettering) at the spine. And finally, pasted onto the front cover of the album, a neat, typed heading which reads: "'Camp Welcome' Saw Mill Bay, Alaska. June 12th 1913. Here's to 'Camp Welcome', a place of good cheer, For even the 'Restless' must needs tarry here; Since we know that our 'BATH TUB' supplied a long need, We are glad that you used it, in return for the 'FEED'. 'RESTLESS CREW'"
New York: Comparahatch Ltd., Publisher, 1975. Cloth. Near Fine/Very Good +. 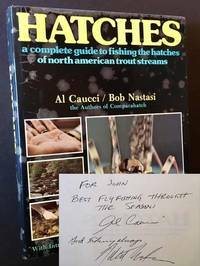 INSCRIBED BY BOTH AUTHORS (AL CAUCCI AND BOB NASTASI) on the verso of the title page. A very solid copy to boot of the 1975 stated 1st edition. Tight and Near Fine (one tiny bump at the lower front tip) in a crisp, price-intact, VG+ dustjacket, with light bubbling to the laminate at the front panel. Quarto, 320 pgs., illustrations and photographs by the authors themselves. 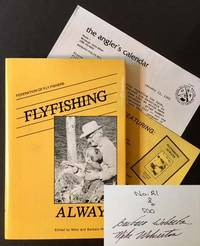 West Yellowstone, Montana: Federation of Fly Fishers, 1984. Cloth. Near Fine/Near Fine. 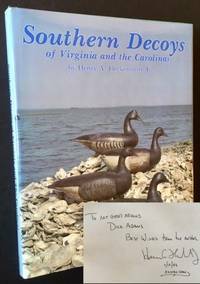 SIGNED BY THE EDITORS BARBARA AND MIKE WOLVERTON IN A LIMITATION OF 500 COPIES. A very sharp copy to boot of the 1984 hardbound edition. Tight and Near Fine (just a touch of spotting at the front free endpaper) in a crisp, price-intact, Near Fine dustjacket, with just a touch of rubbing to the panels. Octavo, also includes some nice ephemera related to the book's publication. New York: Crown Publishers. Inc, 1970. Full leather. Pearce Bates. 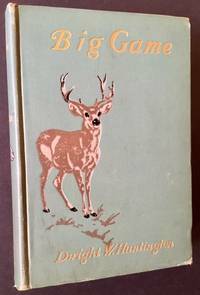 Originally published in 1950, this is the 1970 "deluxe and signed edition", #286 OF 350 COPIES SIGNED BY THE AUTHOR VINCENT MARINARO AND "BOUND IN GENUINE LEATHER". Tight and Fine in its light brown leather. Octavo, crisp black-and-white photos thruout and well-executed illustrations (mostly in the margins) by Pearce Bates. 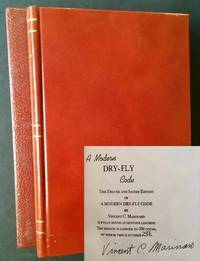 The copy also includes a sturdy, Near Fine example of the publisher's leather slipcase.